Weak eyesight is most often associated with either nearsightedness (called myopia) or farsightedness (called hyperopia). Factors like genetics, poor nutrition, aging and excessive strain on the eyes usually contribute to these conditions. The most common symptoms of weak eyesight are blurry vision, frequent headaches and watery eyes. Be sure to consult your doctor for proper diagnosis and treatment. At times, eye problems can be caused by serious issues like glaucoma, macular degeneration, cataracts and optic neuropathy. Weak eyesight is usually corrected with prescription glasses, lenses or even surgery. 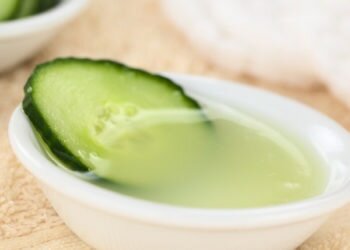 You can also try some natural home remedies to help improve your eyesight. Eye exercises make your eye muscles more flexible, and bring energy and blood flow to the eyes to maintain optimal vision. Regular eye exercises combat eye strain and also improve focus as well as concentration. Concentrate your vision on a distant object for a while. The best way to do this without straining your eyes is to look at the moon and focus on it for three to five minutes daily. 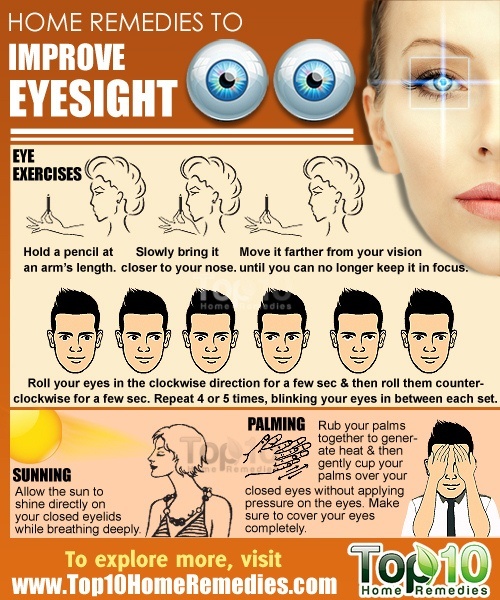 Perform one or more of these eye exercises on a regular basis, at least for a few months, to get encouraging results. Sunning and palming are also beneficial for eyes as these methods help reactivate and flex the eye lens and ciliary muscles. Sunning will provide the benefit of the sun’s healing abilities and palming will promote relaxation and a sense of well-being. According to Chinese culture, the sun contains vital life energies that are critical to the health of the eyes as well as the overall body. For sunning, allow the sun to shine directly on your closed eyelids while breathing deeply. Do this once daily for a few minutes, followed by palming. For palming, rub your palms together to generate heat and then gently cup your palms over your closed eyes without applying pressure on the eyes. Make sure to cover your eyes completely so there is no trace of light. Do this several times daily while visualizing a pleasant scene. According to traditional Chinese medicine (TCM), malfunctioning or diseases in the eyes are often closely related to the liver and kidneys. There are various acupressure/acupuncture points around the orbits of the eyes, which are the bones that surround the eyeballs. 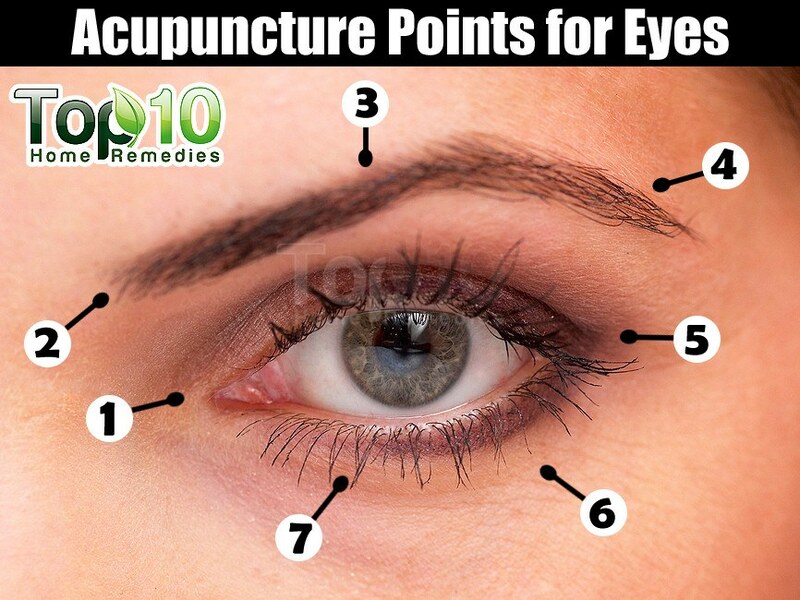 Massage each of the acupressure points around the orbits of your eyes gently for five to 10 seconds. Start from point #1 shown in the image above and go up and outward massaging each distinct point. You can do this several times daily.Note: If you are pregnant, consult a trained acupuncturist before trying this therapy. Also, do not massage areas with scars, burns or infection. Walking barefoot on grass in the morning dew for about 30 minutes is also considered an acupuncture method to help improve eyesight as it activates the nerve fibers connected to your feet. There are reflexology pressure points for the eyes on the second and third toes. Plus, the green color of the grass is soothing for the eyes. Ginkgo biloba improves circulation and eye blood flow. In addition to improving your vision, it protects against problems like glaucoma and macular degeneration. Early research suggests that it may also benefit people with retinopathy. Ginkgo biloba is also known to relieve anxiety and improve memory and thinking, especially in those suffering from dementia and Alzheimer’s disease. Take 120-mg standardized ginkgo biloba capsules daily in two or three divided doses. Note: This herb should not be given to children. Also, people suffering from diabetes should consult their doctor before taking this herb. Bilberry is another popular herb for vision and eye heath. It can also help improve night vision as it stimulates the regeneration of the visual purple component of the retina. Plus, it protects against macular degeneration, glaucoma and cataracts. It is also good for retinal problems related to diabetes or high blood pressure as it is high in a chemical called anthocyanoside that has powerful antioxidant and anti-inflammatory properties. Eat about one-half cup of ripe bilberry fruits daily. You can also take bilberry supplements, after consulting your doctor. Generally, it is advised to take 160 mg of bilberry extract (with 25 percent anthocyanidin) two times a day, a few times a week. Note: As this herb may interact with other herbs and medications, consult your doctor before taking it. Almonds are also great for improving vision because of their rich omega-3 fatty acid, vitamin E and antioxidant content. They also help enhance memory and concentration. Consume this paste with a glass of warm milk. 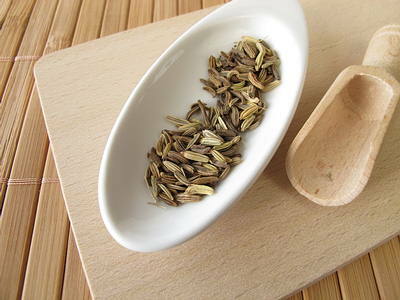 Fennel contains nutrients and antioxidants that promote healthy eyes and also slow down the progression of cataracts. Ancient Romans, in fact, regarded fennel as the herb of sight. Preferably use the larger variety of fennel for improving eyesight. Put one cup each of almonds, fennel and sugar candy (misri) or simply sugar in a blender. Before going to bed, eat one tablespoon of this powder, followed by a glass of warm milk. Do this daily for at least 40 days. Wild asparagus, also known as shatavari, is another excellent home remedy to improve eyesight. According to Ayurveda, this medicinal herb is said to promote a long, healthy life of the eyes. 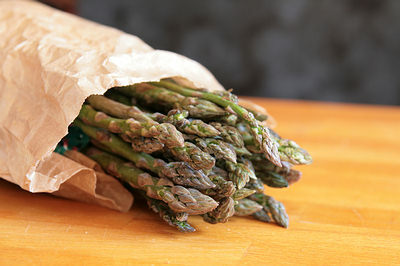 Mix one teaspoon of wild asparagus with one-half teaspoon of honey. Consume this mixture twice daily with a cup of warm cow’s milk. Continue for a few months. Indian gooseberry, also known as amla, is another excellent remedy to improve eyesight. It is packed with several nutrients, especially vitamin C and other antioxidants. Vitamin C promotes healthy capillaries and helps maintain proper functioning of retinal cells. 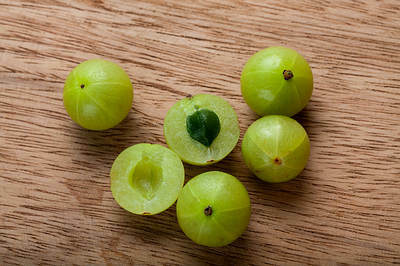 Mix two to four teaspoons of Indian gooseberry juice in one-half cup of water. Drink it twice daily, in the morning and evening. You can also take the juice with honey. Another option is to eat an Indian gooseberry preparation called amla murabba, which is a sweetened preserve. Follow either of these remedies daily for at least a few months. Eat a diet high in vitamins A, B-complex, C, D and E, beta-carotene, amino acids, lutein and zeaxanthin, all of which promote eye health. The chlorophyll in green leafy vegetables also helps improve eyesight. 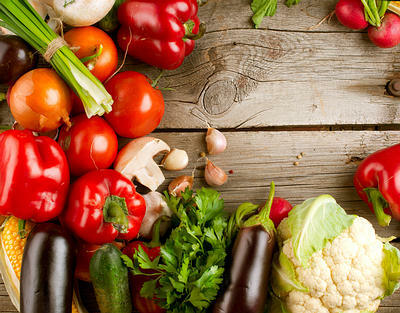 Eat carrots, spinach, corn, beetroot, sweet potato, blueberries, broccoli, kale and other fresh green leafy vegetables. Fatty fish, eggs, nuts and seeds are also beneficial for eye health. You can also take nutritional supplements after consulting your doctor. Do not stay hooked to your television or computer screen as it contributes to eye strain. When working on a computer, position the monitor at a comfortable distance, about 18 to 24 inches away. The height of the monitor should be at or just below eye level. To avoid glare on your computer, get an anti-glare screen if needed. Take frequent visual breaks and rest your eyes every 20 minutes. Avoid reading in dim light as it puts strain on the eye muscles. Do not wear glasses that have the wrong prescription; this is particularly important for children. When out in the sun, wear sunglasses to protect your eyes. Always use good quality eye cosmetics and discard old eye makeup. Get proper sleep as sleep deprivation leads to eye discomfort and blurry vision. Please send me a copy of this . Yes like to read about eyesight. Thanks. Comment:Thank you very much,this piece of information is very vital and useful to me. Picture of the herbals, local language names will be good. Concise and practical, will implement. thanks. Ma’am take 100 gms each of them.dry the almonds in sunlight for half a day.then grind all of them to make fine powder.then consume 10 GMs along with warm milk and do not eat anything for at least one hour.u would definitely find good results. Very useful tips for everyone.thanks for sharing.it’s very best teatment for eyesight. Thanks for the great and informative news.